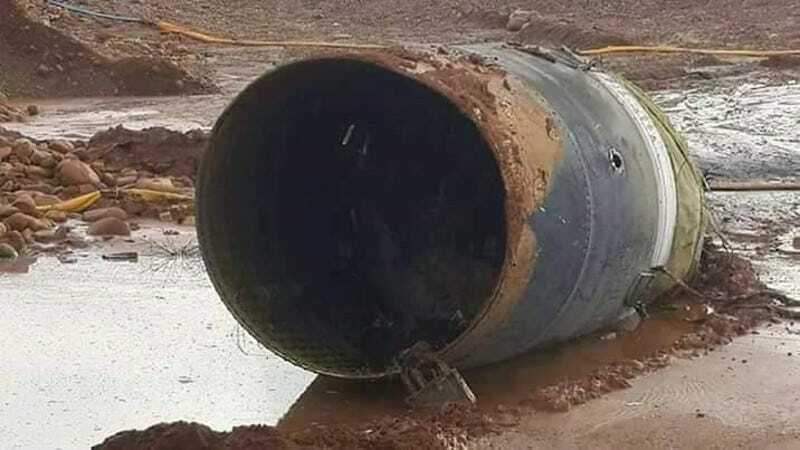 A large cylindrical structure thought to be part of a Chinese rocket has fallen down into a mining area in north Myanmar, while another piece of metal tore through the roof of a nearby house. The metal object, which measures 4 feet (1 meter) in diameter and 15 feet (4.5 meters) in length, fell on the property of a jade mining company, and then bounced up to 150 feet (46 meters) away. Local residents in a nearby village said they heard a loud noise shortly before the metal object was found. Around the same time, another cylindrical structure measuring about an inch wide and 4.6 inches in length—and bearing Chinese script—tore through the roof of a home nearby. The roof was damaged, but no injuries were reported. “Every local thought it was the explosion of heavy artillery,” said villager Ko Maung Myo in the Myanmar Times. “I walked over to it and saw it was part of an engine.” Myo said he thought it was an engine because he found “a diode and many copper wires at the tail of the body,” adding that “It also looks like a jet engine block.” Witnesses said the air near the object smelled acrid, as though something was burning. Initial speculation pointed to satellite debris, a piece of missile, or an aircraft engine, but the incident is likely related to the launch of a Chinese satellite. A Long March 11 rocket blasted off from the Jiuquan Satellite Launch Center on Wednesday night, carrying an experimental satellite. And indeed, the chunk of metal looks like a stage section of a rocket, which falls away before reaching space. This sort of thing—sadly—has happened before. Last year, part of a rocket engine crashed through the roof of a house in northeast China’s Shanxi province. Seems China’s space agency—or whoever is responsible for these incidents—needs to do a better job protecting the people down below.